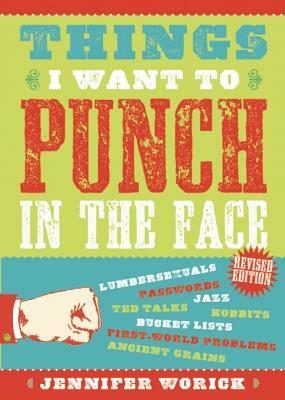 I'm headed south tomorrow, hitting the seriously awesome Powell's City of Books for a Punch Party. I'll be at the Beaverton store (which is at Cedar Hills Crossing) at 7pm and will be talking about the book, reading favorite entries, hopefully laughing my arse off at others' rants, and hosting a spirited game of Punch in the Face vs Make Out With. It's the last official Punch Party of the fall and I hope to see all of my PDX peeps. As I've said before, something magical happens around this book. People open up and connect as they share common gripes. Like this blog and the book, it makes me seriously happy. This is a book that brings people together. Come together tomorrow night! ok, I got one for you. Feel free to blog. Whimsy, whimsical. I just loathe those. Marketers and everyone is using them like they are the everlasting answers to all your unique happiness. Used for things and concepts that don't have a function, purpose, or decent design. So..personalized, so cute, so modern, so revolting. Turns me off immediateley and makes me want to hurl right on your whimsical useless item.